RESTORE | Pro Chem, Inc. RESTORE guards against damage caused by ultraviolet rays, environmental conditions and everyday use. It helps surfaces resist cracking, dulling, hardening and fading and increases pliability. Its protective shield helps maintain a long-lasting, attractive appearance on a variety of surfaces. RESTORE also makes surfaces antistatic to repel dust and dirt. Add years to the life of dashboards, desk chairs, sporting goods, vinyl tops, sealed wood, tires, rubber trim and vinyl upholstery. Before applying RESTORE be sure the surface is cool, clean and dry. 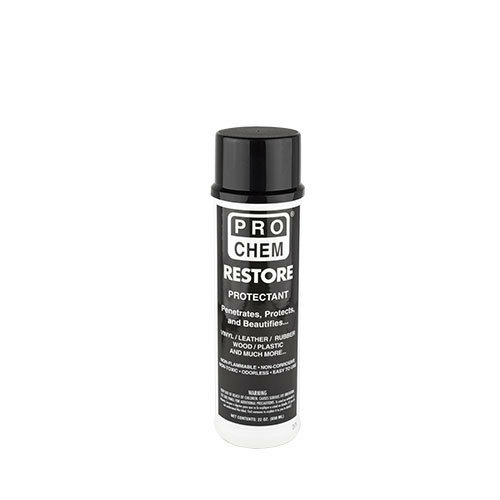 RESTORE can be sprayed directly on surface or applied with a soft cloth. Allow RESTORE to remain as long as possible and then wipe off. On newly treated surfaces, three applications will give best results. Thereafter, reapply RESTORE as needed to maintain protective coating and attractive appearance.